-The Riha Nera Beach it means <<Shallow Waters>> in Myrina near the hotel Sotiris is the beach inside the capital of the island Limnos. It is a long and clean sandy beach with cristal green waters.There are facilities including parasols and sunbeds, watersports possibilities, tavernes and accommodations where you can have a view of Athos .You can surf or water-ski here.The beach is popular with both the tourists and the local people since it is shallow and safe for children. 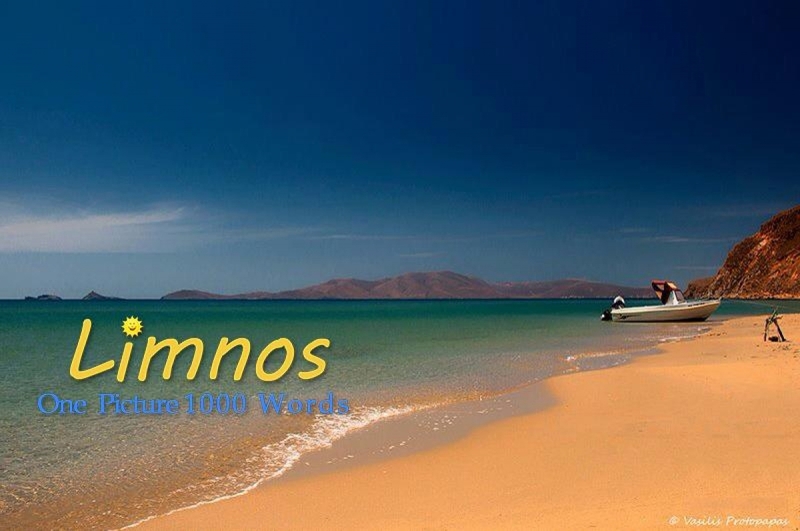 Romaikos Gialos Beach is an organized beach in Myrina offering facilities as well. -Nevgatis beach is situated at 7 kilometre distance from the capital Myrina in south of the island .Nevgatis is very long sandy beach,The waters at the beach are cristal clear It is an organized beach with facilities parasols , sunbeds , water sports possibilities and taverns. - Thanos is situated at 4 kilometer distance from the capital Myrina in the southwest of the island. In Thanos there is also a long sandy beach, where you can have a view of the island of Agios Efstratios. The waters at the beach are cristal clear and it is surrounded by strangely shaped vulcanic rocks. It is an organized beach and parasols and sunbeds are for rent. There are a couple of tavernes . The actual village of Thanos is situated a bit higher up the hill and overlooks the bay. Thanos is an old and pretty village with white houses with red roofs and with narrow streets. In the village you can find a couple of kafenions, a taverna and some shops. Thanos beach has a special section for naturists. • Keros Beach is situated in the east of the island in between the two lakes. It is a 4 kilometers long sandy beach situated in a bay 2 kilometres from the village of Kalliopi. The sea waters are clear and the beach is quite shallow. There can be some wind here and the waves on the southern part of the bay are usually quite high while there are almost none on the north side. At the beach of Keros there is a surf club. Keros Beach is concidered one of the safest windsurfing places in Greece because it’s in the half moon shaped bay and the wind usually blows towards the beach. Sometimes the waves can be 4 meters high. • Close to Moudros are three beautiful sandy beaches in a row: Chavouli, Sagrida and Fanaraki. At the last beach you can also find a tavern and a beach bar. These beaches can be found south of Moudros and they are in a landscape with vulcanic rocks. The road leading to the beaches is unpaved and more suitable for a 4-wheel drive car. Fanaraki Beach consists of two beaches, Mikro (small) Fanaraki and Megalo (large) Fanaraki. Mikro Fanaraki is situated in a small cove. Both Fanaraki beaches are organized with facilities. • There are more quiet beaches in the area, like for instance the fine sandy beach of Parthenomytos with its green waters. Parthenomytos Beach, like these other beaches, can only be reached over a dirt track. There are some trees on this beach that were planted especially to provide the visitors with some shade. At Parthenomytos there is a small coffee bar where you can get refreshments. • Neftina Beach is close to the archeological site of Kavirio, in the north east of the island of Limnos. After leaving Kavirio and before the village of Agios Alexandros you will see a sign pointing to the beach. The last part of the trip to Neftina Beach is over a dirt track which is in bad condition. You can walk or it would be wise to go by 4-wheel drive. After 5 minutes on this road, you will arrive at the beautiful and quiet beach of Neftina. Neftina is a long and sandy beach with clear waters. The beach is shallow, so it is suitable for children. No amenities here (no parasols & sunbeds, no accommodation, no taverna) so you have to bring your own water and food and a good sun lotion. A quiet few hours at the beach of Neftina can be easily combined with the nearby archeological sites of Hephaisteia (Ifestia) and Kavirio. These two sites are situated very closeby south of the beach. • Zematas Beach is situated in the north east of the island, close to ancient Kavirio and not far north of Neftina Beach. This is an isolated and very quiet long sandy beach. • Plaka Beach is situated in a cove in the extreme north east of the island of Limnos (with another beach south of it). It can be reached by following a path from the village of Plaka. Plaka is one of the prettiest and picturesque villages on the island of Limnos, with white washed and friendly houses, a nice white church with a separate bell tower and a lighthouse. There are views over the Turkish mainland and another (Turkish) island. • Kotsinas Beach is situated in the north of the island of Limnos, not far west of the archeological site of Hephaisteia. In Kotsinas (sometimes spelled “Kotsinos) you find the Byzantine Castle of Kotsinas which was built in Kotsinos castle was not built in 1207 during the 4th crusade occupation by the venetian family of Navigajosi. In 1361 it was repaired by the Gatelusi family who ruled Lemnos up until the Turkish occupation. In Kotsinas just outside the yard of the Church and overlooking the sea, stands the statue of a local hero holding up a sword. It is a woman named Maroula. In 1478 the people from Limnos joined the Venetian forces to battle against the Ottoman Turks. Maroula saw how her father was killed by an invader while he was defending the entry to the fort. She picked up his sword, which was lying beside him and then charged against the enemy with much ferocity, inspiring the other people of Limnos. Thus she became the symbol of heroism. The combined forces and the heroism of Maroula forced the Turkish invaders to take their ships and flee from the port. The freedom did not last very long. In 1479, one year later, the island was occupied again and remained so until it was joined with Greece again in 1912. Kotsinas is a small village situated in a bay. There are a couple of tavernes and there is a concrete pier and a small harbour with fishing boats. On the north side of the village lies the beach backed by sand dunes. • Agios Ermolaos Beach with its red rocky coast is situated north west of the village of Kotsinas. It is a quiet and sandy beach with shallow waters and no high waves, making it safe for families with children. There are no facilities / sunbeds / parasols / tavernes here, so you must bring your own water and food, and a good lotion for protection against the sun. Agios Ermolaos Beach can only be reached by private transport or on foot. The name of the beach derives from the Chapel of Agios Ermolaos that was built in 1867. It’s a small stone build church standing on the top of a small hill just above the beach. From here you have a view over the bay and the large sandy beach of Agios Ermolaos. • The beach of Agios Ioannis lies on the west side of the island of Limnos, at 6 kilometer distance from Myrina and 1.5 kilometers of Kaspakas. Sometimes it is simply called “Kaspakas Beach” after the nearby village. The beach is surrounded by large vulcanic rocks. Agios Ioannis beach is a long and sandy beach with a few pebbles and the water is very clear here. At the beach there are a taverna and there are a couple of accommodations. North of Agios Ioannis Beach lies the lesser know beach of Karvoulonakis. • In the first bay north of the capital Myrina you find the sandy beach of Avlonas (1 kilometer distance). This is an organized beach with parasols and sunbeds. There are also accommodations and tavernes at the beach. Opposite the beach are vulcanic islets, making the beach suitable for snorkeling and fishing. Avlonas is more quiet than the beaches in Myrina itself.